The third biggest European insurance company has followed the steps of Axa, Allianz and Zurich by committing to end underwriting new coal plants and mines. In addition to the policies adopted by three reinsurers, Generali’s November 2018 announcement brings the number of big international re/insurance companies limiting their support for coal to seven. The Financial Times has described the evolution in the (re-)insurance sector “a welcome and logical development.” Indeed, according to the latest IPCC report on the impact of warming to 1.5°C, between 59 and 78% of global coal-fired power generation capacity must be closed by 2030. The urgency to close existing power plants was already recognised by other political and scientific institutions: the International Energy Agency’s Beyond 2°C scenario also recommends a total coal exit by 2030 in European and OECD countries, and by 2040 elsewhere. However, if the latest IPCC report makes clear that we need to act on an unprecedented scale to phase out coal, some companies are going backwards when planning new coal plants and mines. In Poland alone, where the COP24 will be held in December 2018, PGE, ENEA and Energa are planning more coal capacity and still more companies plan new lignite and hard coal mines. This was made even worse by the announcement by the Polish energy ministry last week of a draft document that by 2030 60 percent of power will come from coal and existing onshore wind farms will disappear. Ostrołęka C is appearing more than once in the Polish energy strategy draft while onshore wind is expected to be phased out gradually. So much for being in touch with climate reality. 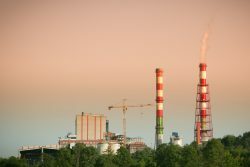 The recent announcement by Generali might be a welcome game changer, as reflected by the difficulties for the new 1000 MW Ostroleka C coal plant to secure insurance support. Developed by Polish state-controlled utilities Energa and Enea, the proposed plant would begin operation in 2023 and run 40 years until 2063 and its pollution could cause up to 2000 modelled premature deaths a year. With their policy on coal, Allianz and Munich Re, also significant coal underwriters in Poland have announced earlier this year that they will not underwrite Ostrołęka C. After the Generali policy update all eyes are on the insurers that have yet not taken similar commitments. Vienna Insurance Group (VIG) and UNIQA are both willing to provide insurance to Ostrołęka C and, in fact have not denied participating in the bidding process. This is not an anomaly for VIG that has been found to have underwritten the recently completed Ledvice lignite plant in Czechia and has a track-record of underwriting coal in Poland. With Generali’s recent move, all major insurers of coal in Poland have committed to not underwrite new coal plants. All but one : Talanx whose Polish subsidiary – TUiR Warta S.A. – hasn’t discarded underwriting the controversial proposed Ostrołęka C hard coal power plant. Substitutes for lack of insurance cover are limited and without insurance no private bank will be lending to coal developers. The smaller the country and its financial market, the bigger the significance of Generali’s policy and earlier policy announcements of Allianz, Swiss Re, Munich Re and Zurich. Coal developers in the Balkans, Romania, Bulgaria, Greece, Hungary, Czechia, Poland and crisis-stricken Turkey will realise that their chances of finding underwriters of their coal projects will become ever more difficult. As revealed by the French vloggers collective Partager C’est Sympa in a video hosted by Europe Beyond Coal campaign Talanx, VIG and Uniqa are under increased scrutiny from European citizens, activists and campaigners worried about the future and health of their children and families until they follow Generali and other European insurers and publicly commit to stop providing insurance for new coal power plants and mines.